The first black and white horror film I ever took the time as a teenager to watch was Jean Yarborough’s The Devil Bat, starring the great Bela Lugosi. This was just before the dawning of the age of DVD and I thought my $3.99 VHS tape purchase was a steal. I had no idea what public domain was, nor would I have ever expected just how important the state of public domain works were and have been to the arts. I picked up a tape that was as far as I was concerned, on par with any other video in my collection and it stood on the shelf alongside such perennial essentials such as The Evil Dead and Demons without a second thought. 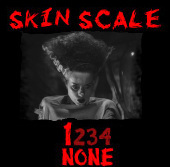 DVD ushered in a new era of horror and with the new era came a new medium of discovery, the Internet, to which I was able to unearth that the little forties b-movie that could actually had a sequel! Unfortunately, Image DVDs were pricey here in Canada way back when and only a couple years back did the price drop enough for me to get my hands on their DVD that featured the daughter of the boss of bloodthirsty bats, Dr. Paul Carruthers. I’ve been saving this one for a rainy day for a while now, and I’m sloshing on the doc’s deathly cologne right now wondering if it’s been worth the wait. If it’s as bad as it could be, consider my body donated to mad science. We open on a catatonic young lady named Nina (Rosemary La Planche) who was found in the middle of the road by a gentleman on his way to New York. The police have scavenged enough information to know that she is the daughter of the infamous “Devil Bat” murderer, Dr. Paul Carruthers. As doctors begin to study her condition, she gradually begins to come to, but when night falls, she’s plagued by vicious, bat-laden dreams featuring her father. Not wanting to stay at a hospital, Nina escapes and convinces her doctor, Morris (Michael Hale) to let her stay in his home to recover. Although unrelenting at first, Dr. Morris gives in at the request of his wife. But, stranger things begin to happen and the nightmares become more vivid, transcending the dream world into reality. Is Nina a vampire? Is she being possessed by the demon of her demented deceased father? Or are the secrets even more sinister, dare I say, even battier, going on behind closed doors? 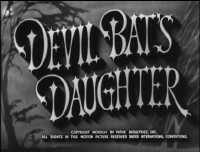 Devil Bat’s Daughter is a respectable, cheap effort that fans of the original will become involved with until the climax; which will make sense in terms of the sequel’s story, but be seen as utterly ridiculous to viewers who watched Bela Lugosi knock off soul after soul in the original by method of ravenous, mutant bat attractant aftershave. Unfortunately, this ending pretties up the garden just a little too rosy at the expense of the film at hand. Where it does succeed is during the opening half hour or so when the story really amps up the evilness of the Dr. Carruthers character from the first, even going so far as to suggest he killed his wife and perhaps was a vampire himself. At these points in the film, I found myself happy that a sequel had been made because even if it didn’t turn out as good (which, obviously, it doesn’t), future viewings of the preceding instalment would consist of that much more macabre in the Carruthers character I have been entertained by for over a decade. The plot isn’t overly heavy, but has some weight to it in the form of a half dozen logical red herrings, romantic and adulterous subplots, a wealth of mystery and not to mention the hope of an even more extraordinary climax that the script ultimately doesn’t provide. Murder scenes are few and far between, although one packs a particularly good jolt, and the devil bats are used more as demons of the mind in this mystery/horror compound than a tangible threat as in the first. More than anything, I found myself waiting for Bela Lugosi to pop up in a secret lab somewhere and start siccing his hungry minion on a bloodsucking rampage more in tune with the first film. With all the extra emphasis on plot in this one, maybe ol’ Bela would have had a little more to play with instead of essentially making the movie a gem on his own. Image’s menu-less DVD may be official, but don’t expect it to look much better than the copies of The Devil Bat you have kicking around in your collection from the various public domain distributors. Audio pops and muffles a bit in spots, but is still fully understandable and the video is a touch soft with lots of scratches, lines and other imperfections. 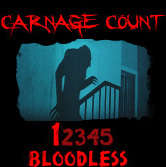 Still, it’s very watchable and at the low price point, ultimately a worthy, nostalgic addition to your terror library. The primary drawback is that diehard Devil Bat fans will certainly be driven batty from the inanity of the ending. Ironically, as happened so many years ago online when I discovered a favorite film of mine had a sequel; in writing this review I have discovered that it was essentially remade as The Flying Serpent, also available from Image. And with that, the hunt for another slice of schlocky horror starts anew… Rent it!